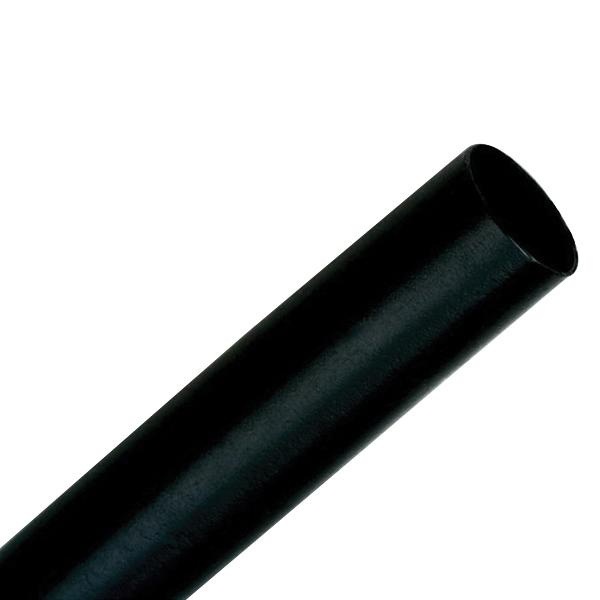 3M Thin single wall heat shrink tubing in black color, withstands voltage rating of 600-Volts. It has flexible polyolefin construction with shrink ratio of 2:1. This 48-Inch tubing has expandable diameter of 0.75-Inch and recovered diameter of 0.375-Inch. It has tensile strength of 2400 PSI. It offers shrink-fit protection and strain relief of solder joints, wires, terminals and connections. It has dielectric strength of 900-Milli-Volts. This heat shrink tubing with header label, balances electrical, physical and chemical properties for various industrial and military applications. This tubing with 0.03-Inch wall thickness, typically serves as a shrink-fit electrical insulation over cable splices and terminations. This tubing is suitable for lightweight wire-harness covering, fire-resistant covering, wire marking, wire bundling and component packaging. This tubing withstands temperature rating of -55 to 135 deg F. Heat shrink tubing is UL listed, CSA certified, RoHS compliant and meets SAE-AMS-DTL-23053/5, AMS-3636, AMS-3637 as well as ABS standards.